Maurice Gaston Boyer was the Senior exclusive surveyor at Havre office, joining Lloyd's Register on the 29 January 1903. "Considered the application received in response to advertisement for a Senior Surveyor at Havre. The Committee had before them a printed list of the several candidates 14 in number, setting forth their qualifications. Read a memorandum of remarks offered by the Chief Ship Surveyor and Chief Engineer Surveyor. Resolved that Maurice Gaston Boyer be appointed Senior Exclusive Surveyor to the society at Havre at a salary of £300 per annum. On the usual terms and subject to his undergoing at the hands of the Physician to be approved by the Committee"
He was married and had a young daughter. He served as Lieutenant d’Artilliere-à-piéd (Foot Artillery) and eventually become a Captain with the Regiment d'Artillerie Lourde (Heavy Artillery Regiment). He served in France for 51 months and won the Croix de Guerre in November 1916 and Chevalier de la Legion d'Honneur in December 1917. 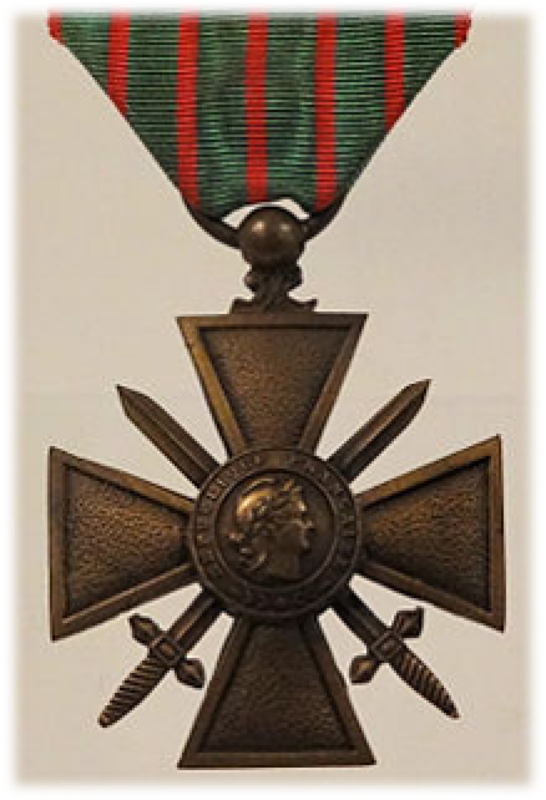 The Croix de Guerre was created in 1915 and was given to those who had distinguished themselves in battle and had been mentioned in dispatches. Following the war, Boyer rejoined LR in Havre on the 17 February 1919. "The Deputy Chairman called attention to the cases of three officers of the Society, Mr W. Cowie of Pensacola, Mr M.G. Boyer of Havre, and Mr J.T. Munro of the London office, who have been put to heavy expense through having had to undergo surgical operations and it was ordered that a grant be made to each of these offices in respect of their expenses, the amount of which grant being left to the discretion of the Chairman and Deputy Chairman"
This operation was likely linked to his injuries following the gas attack. Boyer died on the 19 October 1919 and, because his death was linked to his service and injuries received during the war, he is recorded on our memorial. "Madame Boyer granted a pension of £79.2.6* p.a. for herself and an allowance of £25.8.9 p.a. on account of her children, both amounts to date from 19th Jan 1920, the latter to be reduced to £18.12.6 in February 1922, and to £9.16.3 in Nov 1922, and to cease on 8th March 1926"
If Maurice G Boyer is one of your relatives or you know more about his life, get in touch at hec.info@lrfoundation.org.uk!